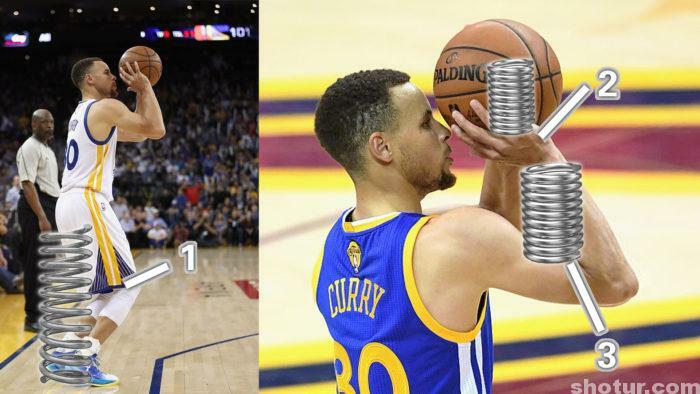 This post I will analyze Stephen Curry’s Logo shot skills secret with spring force. 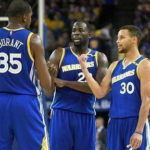 Stephen Curry’s 3-point shooting skill is really amazing, he shoot a three so easy and accurate, every 3-point shooter has a dream that is we can shoot a Three just like a perimeter shot, we can shoot everywhere after dribbling in basketball court, Stephen Curry makes the dream come true. 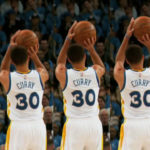 Many basketball players want to shoot like Stephen Curry, not only because we want make our normal 3-point shooting accurate, especially we want to shoot from the Half-Court Logo just as Stephen Curry, his logo shots really made us crazy. 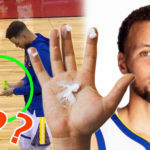 This post I will show you the secret about Stephen Curry’s Logo shots, after learning these skills, you will shoot from the Half-court Logo just like Stephen Curry. First lets talk about the spring force of basketball shooting. If you play basketball several years, you may hear about some coach said that make force just as a spring to release the ball. It always means press the ball to your shooting hand and your wrist will be like a spring, if your shooting hand and forearm make an angle neerly 90 degrees, the release force just like a spring force. Actually there are not only one spring force when you are shooting, your wrist and shooting hand are the first spring, your legs are the second spring, our shooting arm is the third spring. 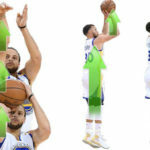 Stephen Curry’s Logo shot has two important tips, the first tip is the spring force helps him to shoot with less force, the second tip is straight force theory lead the long shot accurate. The straight force shooting theory I have shared and will be more in the future. The most members of my website want to know how to shoot a ball to hit the hoop, they all think their force are not enough, but actually you just need this spring force skill, after you master the skill, the most of teenagers can shoot from Half-Court Logo easily. 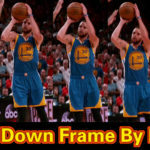 In fact, not only Stephen Curry’s shooting form is fit for the spring force, no matter you shoot with what kind of shot form, you can utilize this spring force skill and shoot from the Half-Court Logo. Lebron James has been shot from the half-court with high-elbow shooting form, I still test the high elbow shooting form from the half-court logo. Some members of shotnba.com mastered this skill and they send the videos to me to prove this. 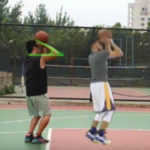 So if one day, you mastered this spring shooting force and shoot from the half-court logo, don’t forget to leave a comment on shotur.com. Now let me show you the detail about the spring force. There are 3 steps for the spring force shooting skill, the first step is catch ball tightly, the second step is lift the ball quickly with no stagnation, the third step is join the release point with spring force. The first step, catch the ball tightly, this is the foundation of the half-court shot. If you do not catch the ball very tight or with wrong hands position, your half-court shot will not have enough force. 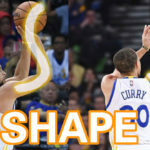 When Stephen Curry shot from the half-court logo, when he catched the ball, his two hands always from the two sides of the ball, not the shooting hand on the ball and another one under the ball. 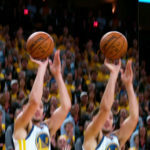 This skill is very helpful for preparing to shoot the ball, it make your two hands almost paste on the ball, do not intentional to leave some space in your palm, no matter you shoot with hard hand type or soft hand type. 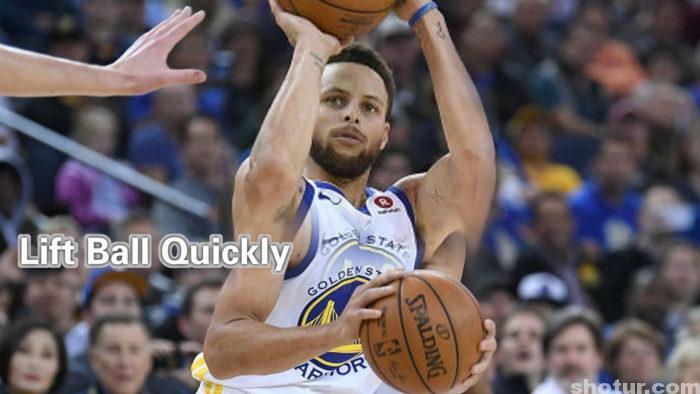 Paste whole your hands on the ball, this will maximize your shooting force. 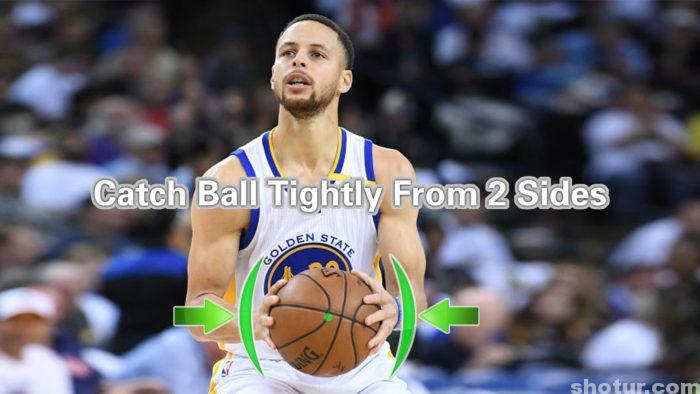 After catching the ball, you can adjust the positions of your two hands to a comfortable position naturally, just like Stephen Curry, his right hand is a little on the top of the ball, the left hand is underneath the ball. Of course your two hands still paste the ball tightly. Then we need the second step, that is lift the ball quickly, actually, if we lift the ball with normal speed, we can also shoot from the half-court, but we will shoot with a little more force, so almost all players shoot from the half-court logo lift the ball quickly, this will help us to accumulate more force to shoot. So the spring shooting form is also attach to non-stop shooting form. The third step is release the ball with spring force. 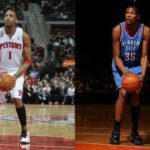 We all know that 3-90-degrees theory is very helpful for our upward shooting, but actually this theory is just fit for a part of shooting forms, especially the normal 3-point shooting position, if you stiff understand the 3-90-degrees theory, just as Reggie Miller, you may feel that sometimes your shooting force was not enough. The Spring Force skill will improve this. No matter you shoot with low elbow or high elbow shooting form, your forearm and your upper arm can combine to a catapult, it can shoot with spring force. Make the angle as small as you can, and release the ball from your right side of your head, press the ball to the whole shooting hand tightly, then the spring is created. Please note the low elbow shooting form will be better for half-court shot, it will be a little more stable. 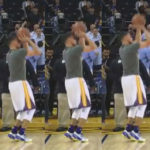 The most half-court shooters choose the low elbow shooting form, such as Stephen Curry and Tracy McGrady. Many NBA players can shoot from the half-court with the spring force, such as Stephon Marbury, he has been shot from the hal-court logo in a NBA game. 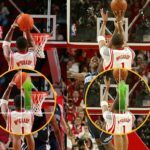 The most famous half-court shooter was Tracy McGrady, his logo shots performance really shocked us in the 2005 NBA Hurricane Relief Game, I estimate Stephen Curry was also watched Tracy McGrady’s logo shots and got some inspiration. 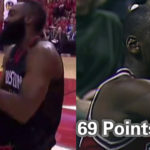 Another famous half-court shot show was also made by Tracy McGrady, he shot 7 in 7 in a Houston Rocket training, he shot so arbitrary but so accurate. All Tracy McGrady’s half court shots are released with spring force, so he can shot so elegant. 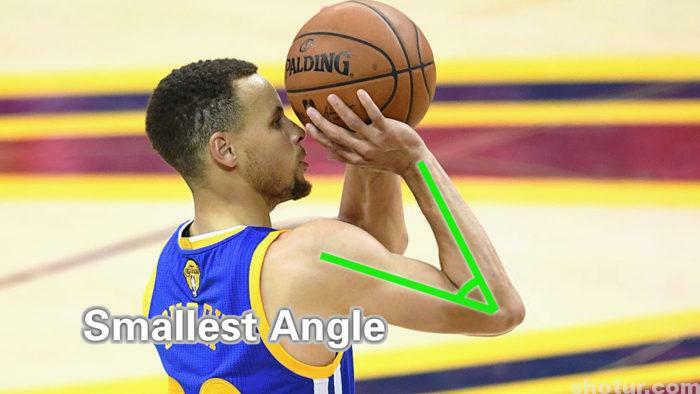 When Stephen Curry shoot from the half-court logo, his right elbow is lower than his shoulder, his upper arm and forearm make the smallest angle, at this time the spring force will be maximized. 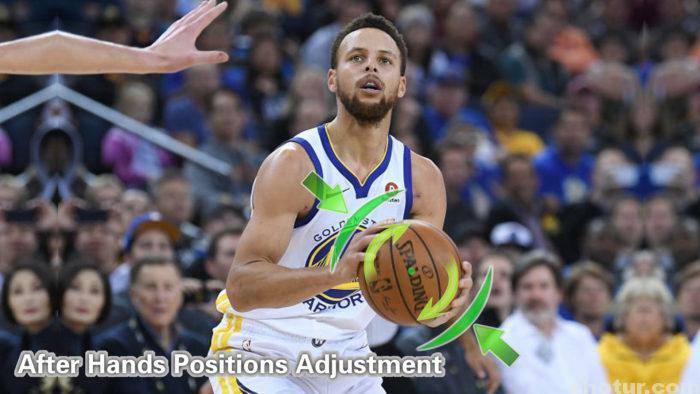 His right hand is on the forward right of right eyebrow, the right shoulder must be tensed, because of your left hand press the ball with a big force, to keep your two shoulders balance, your right shoulder should make some force to neutralize it. Your forearm should be looked vertical on the right of your head in the front view. Your right shoulder should a little ahead to your upper body, this will free your shooting arm and maximize your shooting force. When the spring force is ready, we should release quicker than normal, because quick release will help us shoot with less force. 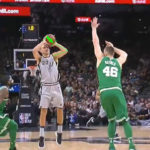 Your shooting arm should proactive to release the ball, remember never shoot with two hands, one hand shooting can give the ball most force, the two hands shot can not accurate, and two hands shooting’s force always less than one hand. 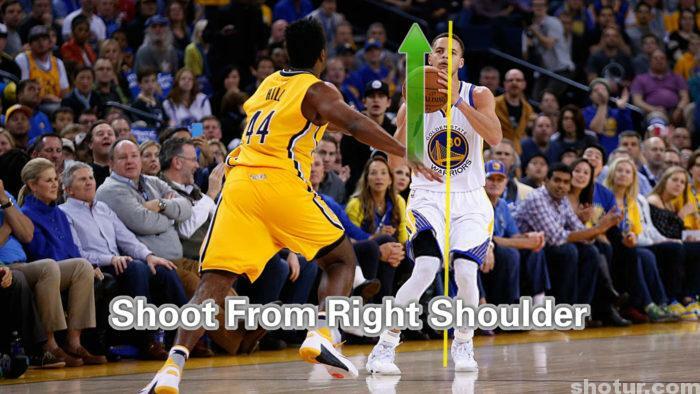 Remember Stephen Curry’s shooting form is attach to the right shoulder shooting form. 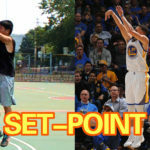 The spring shooting force skill I almost all told you, hope you can shoot from the half-court logo as soon as you can. 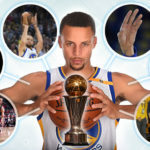 i think you have mentioned almost all techniques of curry”s shooting skills,BUT I WNAT TO LEARN MORE ABOUT HIS FOOT WORK WHEN SHOOTING AND THE WAY HE COMBINE HIS UPPER BODY AND LOWER AND INCLUDING HIS TOES. OK, I make a plan for this. only 3 or 5 times half-court shooting training in my season 2 videos, and in the last videos.